The Mandela Fellows celebrated America's Independence Day by making popular foods from their home countries for a potluck picnic at St. Mark's On-The-Campus. Jennifer Achiro traveled 8,200 miles to the University of Nebraska–Lincoln with a determination to help her home country. But, for the Ugandan native, the path to do so was not very clear. The experience forged lasting relationships in Lincoln — both at the university and in the community — that have paid dividends in furthering the mission of her non-profit, Child Mothers Initiative-Uganda. The project empowers rural teenage mothers and increases access to better education for their children by generating income-producing activities with locally available resources. “The impact the fellowship has had on me and our organization cannot be measured,” Achiro said. “It taught me to act locally but think globally. "A lot of our training here has been activity based. We’re really involved and that makes us think, reflect and engage." Two of those connections were with Linda Major, assistant vice chancellor for student affairs, and Linda Moody, assistant director of Civic Engagement. Both suggested Achiro work with students to increase exposure of her organization. Major reached out to Nancy Mitchell, professor of advertising, to see if her students could help. The undergraduates in Mitchell’s freshman honors course, Ethics of Persuasion, tackled Achiro’s marketing questions while furthering their education. Donde Plowman, Executive Vice Chancellor and Chief Academic Officer, leads a discussion on strategic planning with the Mandela Fellows June 26 in Hawks Hall. Achiro said working with the students was the highlight of her post-fellowship experience. The Mandela Washington Fellowship is the flagship program of the United States Department of State’s Young African Leaders Initiative and brings 700 community leaders from 20 countries in Africa to take part in programs at 27 elite academic institutions, chosen as host sites. Nebraska is in its second year as a host institution. The program is led by Sonia Feigenbaum, associate vice chancellor for international engagement and global strategies and the institute’s academic director; Katrina Jagodinsky, academic leader; and Maegan Stevens-Liska, administrative director in the Office of Global Strategies; and Major. 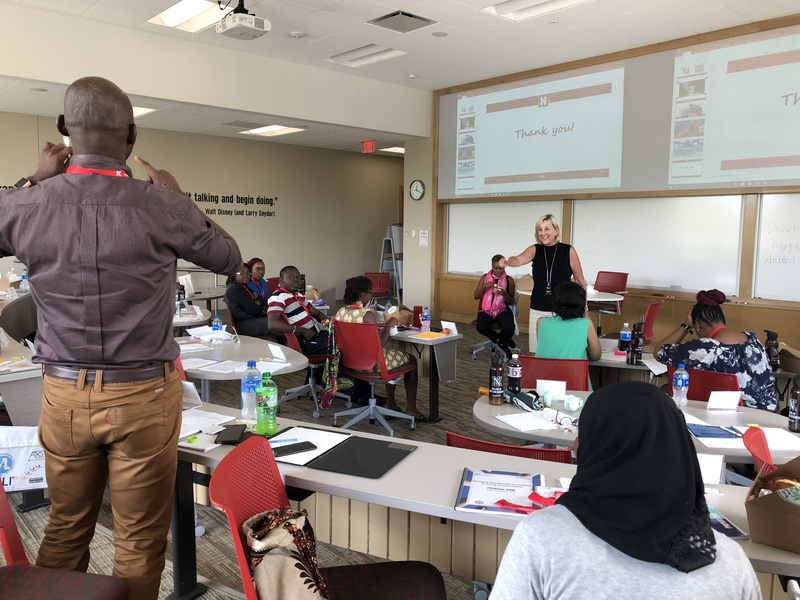 The new class of Mandela Fellows started the Civic Leadership Institute at Nebraska June 20, and the entire program leadership team has already witnessed the formation of new mentorships, collaborations and friendships. Jennifer Agunloye, a 2018 fellow from Nigeria, said her Nebraska experience is laying a foundation that will be beneficial for her organization, which also helps young women find opportunities. Agunloye said she plans to apply for a reciprocal exchange and bring a Nebraska mentor to Nigeria. The reciprocal program is a post-fellowship opportunity that fellows can apply for through the U.S. State Department. The 2018 Mandela Fellows celebrated Nelson Mandela's 100th birthday with a tree planting on campus at the University of Nebraska-Lincoln, July 18. Andrew Zimbroff, extension specialist in textiles and apparel entrepreneurship, completed a reciprocal exchange in the Republic of Seychelles in 2017, where he taught an intensive entrepreneurship course. Zimbroff encourages colleagues to do the exchanges because they make positive impacts and build global partnerships between the university and host countries. Moody said future Huskers also gain from the partnerships built through the Mandela Washington Fellowships. Those include classroom projects such as the one Mitchell’s students completed. 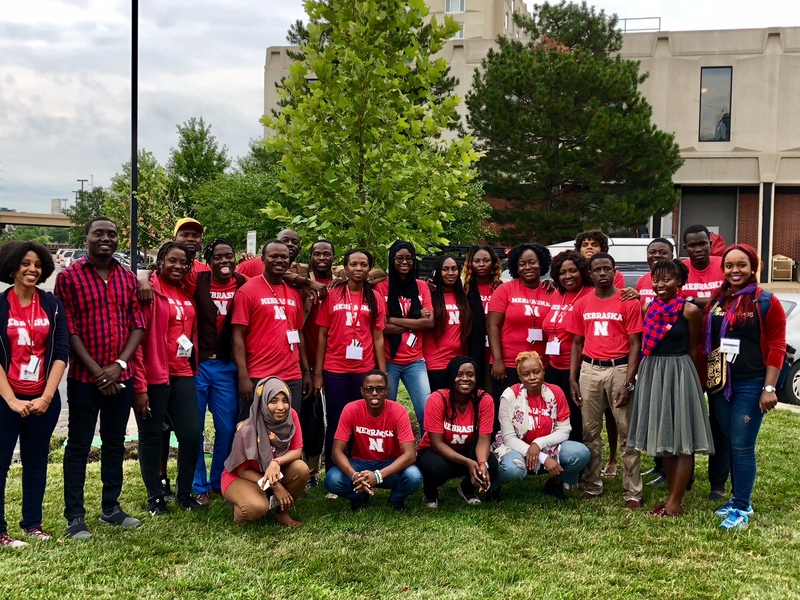 The 2018 Fellows celebrated the 100th birthday of the program’s namesake, Nelson Mandela, July 18 with a tree planting and a reception at the Midwestern African Museum of Art. The Nebraska portion of the fellowship will wrap July 29.